These molded-plastic beads could be strung together in flexible chains using an ingenious “ball and socket” connecting method. Many of us remember playing with them as children, but these “toys” began as costume jewelry for adults. In the 1950s, Providence-based company Coro debuted beads that could adjust to form an opera-length rope or a choker in seconds. 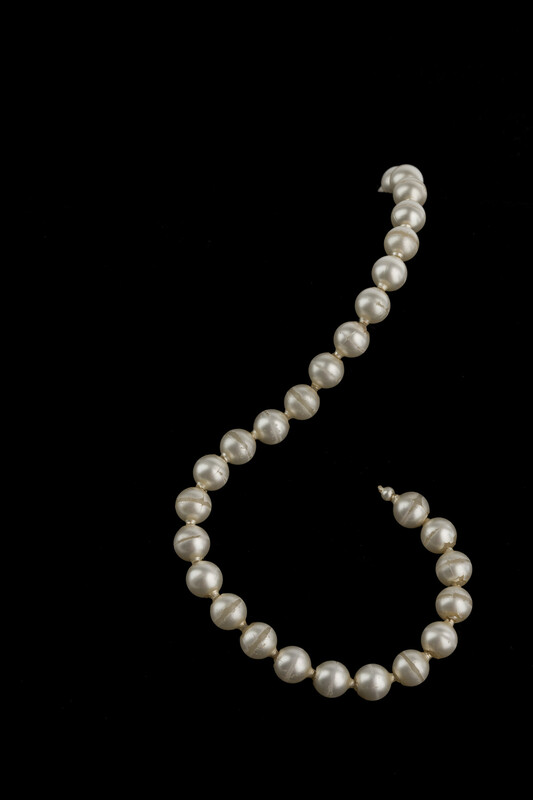 Nina Fletcher Little purchased many sets of “pop” beads over the years but her favorites were this set of pearls. She wore them nearly every day in the last years of her life. Who better than a folk art scholar to appreciate the appeal of mass-produced yet personalized jewels? Items such as these are precisely the kind of jewelry Historic New England wishes to add to our collection. Few people realize the importance of saving the pieces we wear every day. It is those objects that allow us to tell the story of our lives. Explore more of Historic New England’s jewelry collection.